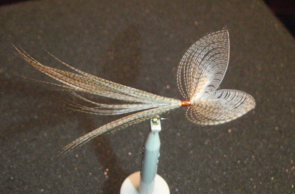 I was introduced to the Wally Wing style of winging by talented fly tier, Henk Verhaar, who appears in the video on this page. It’s an elegant, form of wing that offers translucency and many variations for the imaginative tier. As many of you must know by now, I tie most of my spinners with a peccary body and a Wally Wing. The wing traps air bubbles and filters light creating the glassy feel of a real spinner wing. You can see some completed flies HERE. Today’s entry is primarily to demonstrate the technique of splitting a duck feather (most long fibered feathers will do equally well). Just a quick note that many times while demonstrating this technique, a person will mistakenly call this style wing “a wonder wing”. 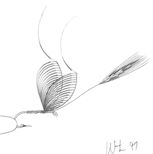 Although a terrific wing, the wonder wing is made from 2 feathers as opposed to splitting a single feather. So thanks to Wally Lutz for allowing me to use his wonderful illustrations, and to Henk Verhaar, for demonstrating this wonderful technique. Diagrams courtesy of Wally Lutz, inventor of the Wally Wing. You can find Wally’s Website by following this LINK.